Last days have been an incredible spiral of events and gatherings! We can call it many names but the ReLoveUtion in this part of the planet has definitely spiraled up! A dear friend says that for social change we cannot really do anything but create the conditions for that ReLoveUtion to happen. It looks like we are letting some things happen! Last week we had our 7th Karma Kitchen evening in the part of the planet we call Burgos, Spain! It was a wonderful gathering with many volunteers and guests! Some pictures show it better! After Karma Kitchen, next day we started our weekend gathering! Again, pictures tell it best. The gathering can be described in many ways, but words will have it difficult to transmit all the magic that happened! . From amazing circles of sharing and listening, to silent walks, to inspired leadership talks or visit to a monastery… Everything flowed magically in the village of Castrojeriz. Few months ago (from what we know ) we were already preparing for this wonderful event. First logistic thing we did was to rent a hostel for 30 people. A dear friend of us connected us with Javi from Albergue Rosalía… Javi was incredibly kind and generous from the beginning… He was moved by the intention of the retreat and he decided to offer us food as a gift! Food for 30 people and 3 days! Amazing! Then we were looking for a room to do all the activities and circles… We had many options that were also generously offered! We ended up in this beautiful place, donated by the local corporation Thank you too! With people, food and shelter ready, we only had to do little more! More gifts started to get ready. In a conversation with a dear nun from the nearby Santa Clara monastery she was also moved by the intention of the retreat and she decided to offer an activity for the weekend, apart from more food and inspiration and friendship. We were thinking to go and listen to them chanting and praying, and then they offered us to offer words, songs or prayers for world peace. I told them we are not from any particular religion or creed, but they were happy to open the doors of their church and listen to our diverse petitions and songs who are very much connected to their daily prayers and contemplation for world peace. It was one of the most beautiful moments of the retreat! Miki offered a song for Nature, Rose Marie offered the Our Father prayer as it was originally translated to German from Aramaic, Madhu, Diken, Mukesh and others offered prayers from India, including Gandhi’s all religion prayer, Bea offered Golpe a Golpe song and so on… For me personally it was an incredible feeling to witness the richness of our diversity in such a temple. And it was also beautiful for the nuns… From the inside of their monastery behind the bars, they were giving heartfelt applauses to all our interventions . In the gathering we were reflecting on how spirituality and healthy sense of humor are closely connected… In that spirit Miki thank the nuns for the opportunity to have such spiritual karaoke . During the weekend we also had few presentations! Joserra and Miki gave a little bit of context for the group in the form of stories and shifts.. They shared about many of the local and global experiments that are igniting our collective journey towards greater good in the World. José Juan (JJ), a very dear friend and expert business man, coach, and what not, talked about the 4 “H”s that every authentic leader should have… In Spanish: Honestidad (Honesty), Humildad (Humility), Humanidad (Humanity) and Humor (sense of Humour)… 4 values that he has been practicing for many years… Soon you will have more material about him, including the video of the speech and an interview! He talks a lot about servant leadership or ladder-ship …Talking about these kinds of leadership, he shared how beautiful it has been when he has found leaders that asked him: How can I serve you? What can I do for you? This type of leadership is so far from the model we usually find in our companies and organizations nowadays… What can I get? How can I get more? This is the underlying question that explains many dynamics in nowadays societies… In this sense JJ usually goes to the root of it… Laddership talks about leaders as facilitators for others, people that make your life more beautiful and easy and not the opposite. 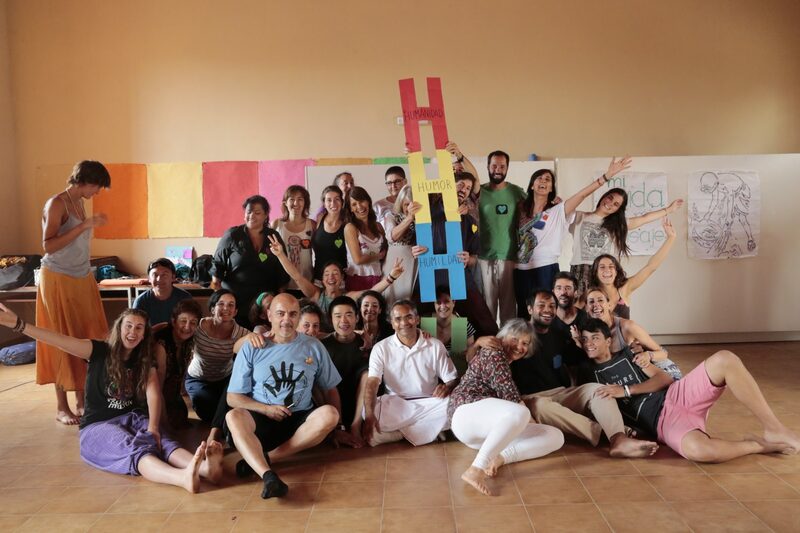 JJ brought 4 big “H”s made of cardboard… and in the end of the retreat we realized that the 4 together make a perfect Ladder!!!!!!! Amazing! In his talks he always states that we all are leaders… We all have our areas of influence where we can do our little bit to create positive change in the world, through small acts or small practices; at least that, and from that, what not? He says that at least we are leaders of our own selves, and that’s already a lot to lead . Another beautiful sharing we had was Geno’s one! Geno is doing a lot of experiments with different kinds of wealth in Madrid! She is an expert in social coins, local coins which try to enhance a more altruistic way of relating with people, other beings and material resources. She gave as an incredible graph were we could see how the derivatives from the stock market are more than 70 % of totals global economy nowadays.. That means that most of the numbers we use today to evaluate our economy (like the GDP) are largely affected by these derivatives, which are usually based on speculative investments were the only thing that matters is to earn fast money, without caring about the consequences that those speculative movements may have in the real economy and real life. Geno is part of an experiment in Madrid, were they are turning waste into active capitals for the community. They have connected with many dumping sites and they are collecting the waste to turn it into compost. They are also connecting with restaurants and other institutions that produce waste. In that process a net of people is emerging and a social coin is in the process to come . For Geno, the shift in relationships is crucial if we really want to call these new coins, social. The first day then, the Head day, was the launch pad from where we jumped into the sea of our weekend experience. As Gandhi used to say people need to develop equally their Head, Heart and Hands. Before, in between, and after having some food for thought and reflection time, we moved towards other parts of our being. During the weekend we also had some breakout sessions to talk about Laddership and Leadership, Collective Spaces, Inner Transformation and Social Action, and Money and other forms of Wealth… Soon we will add a recap of these conversations . Sunday was the culmination of our retreat, and many gifts emerged too that day! Tati offered a wonderful Biodance class. Biodance is a process were one learns how to relate to oneself and to others through body expression and movement. It is very much connected to the heart, as these images of the process show . We ended up with yet another circle, were everyone expressed the feeling in their hearts… We were all filled up with a lot of love, hope, and generosity… We really felt the power of the circles, the power of being together with an intention to grow inside and serve outside, the power of many, the power of one! Awakin Circle for World Peace on Monday August 1st! Volunteer gathering under a centenary tree.